Posted by Jenny in Uncategorized. Jenny on a recent hike. Hello to all readers of Jenny’s blog. Tragically Jenny has passed away. She was following her passion, hiking in the Smoky Mountains, and evidently she had an accident. 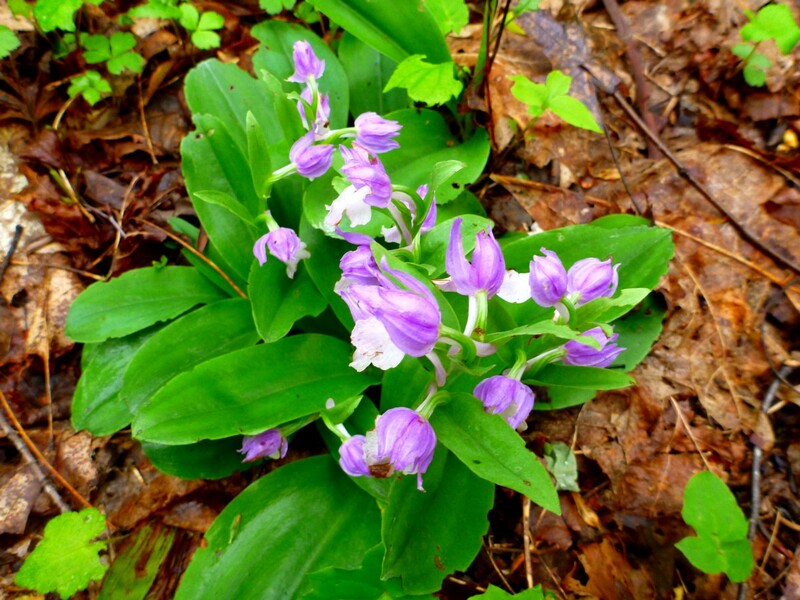 She was located in one of her favorite hiking areas, Porter’s Creek / Lester Prong. There will be a memorial hike into this area sometime in the future, probably later in the summer. 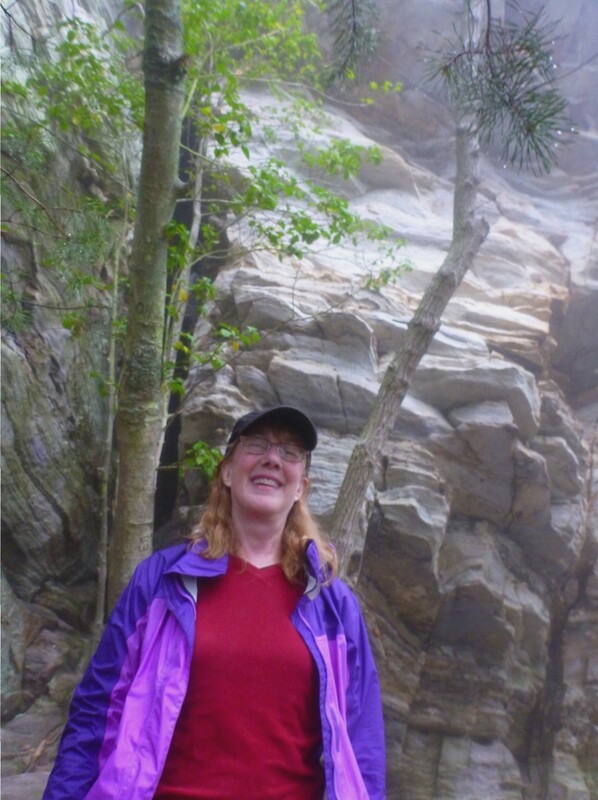 The hike will involve the Smoky Mountains Hiking Club and all of her hiking friends are invited. This is written by her brother Peter Bennett of Bozeman Montana. I will be posting more information about Jenny and the memorial hike as the plans develop. 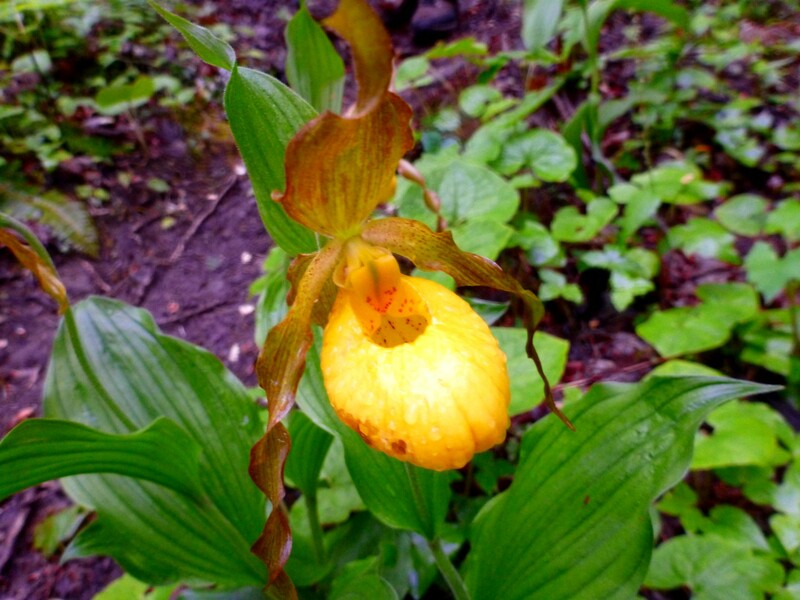 Posted by Jenny in bushwhacking, hiking, Life experience, nature, Smoky Mountains. 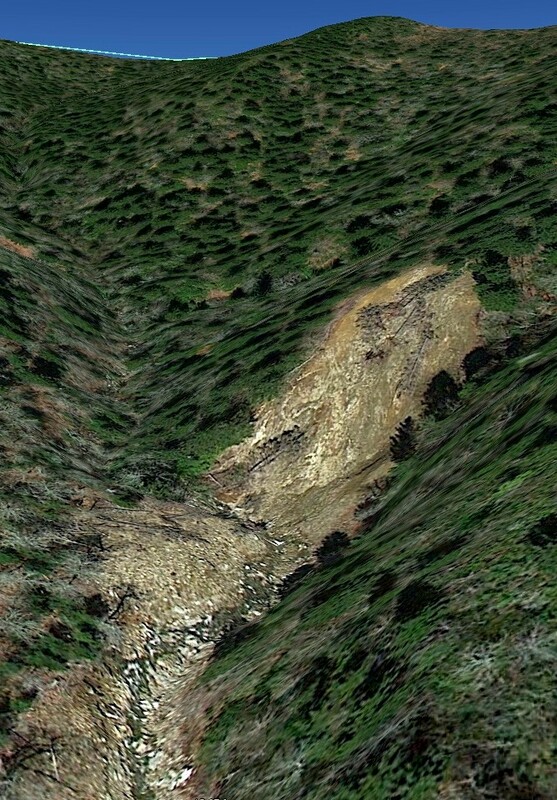 Tilted image of the upper landslide. Courtesy of Don Casada. 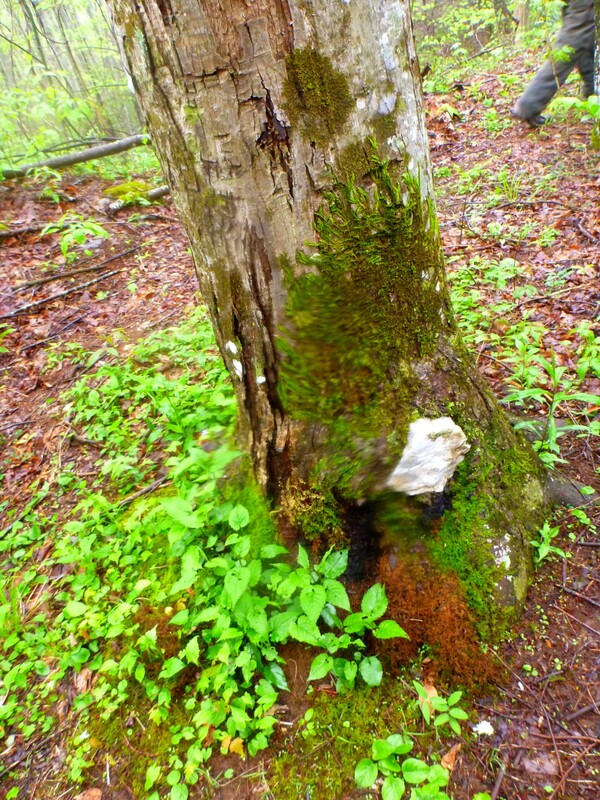 Added 5/27/15: I was in the Balsam Mountain area to hike with a friend and took the opportunity on my way back home to explore up the fisherman’s path along Straight Fork that I discovered at the end of the outing described here. I shouldn’t really say “discovered” as if I’d found something new, as fishermen and other folks familiar with the area have always known about it. It is a very clear path, easy to follow. I went as far as the junction with Table Rock Branch and saw that it kept going. So that would definitely make the route up Straight Fork more manageable. I will only be in the Smokies one more week. I decided that I must try to go take a look at something I have been curious about. And this, I knew, would be an adventure. I did not succeed in setting foot on the gashed-out area depicted above. But I got pretty close, and I still had an adventure. I hope that the following information about my experience will help others who are interested in exploring the area. 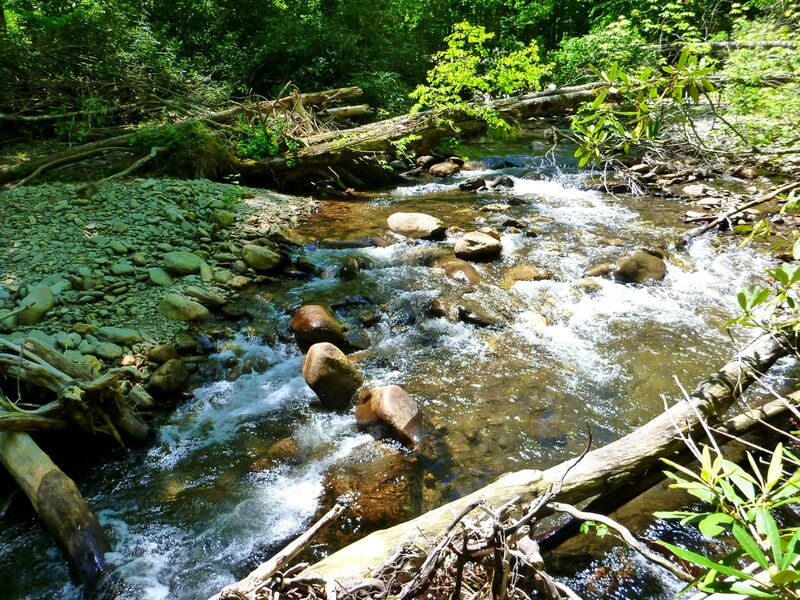 In the last week of July, 2011, a massive flash flood occurred in the drainage of Straight Fork, a stream that flows from the heights of the Balsam Mountains down into the Cherokee Reservation. It nearly destroyed the tribal fish hatchery, which is a major part of the economy on the reservation. Whenever you order trout at a local restaurant, or catch an oversized trout on lower Raven Fork or the Oconaluftee within the reservation, chances are it originated at the hatchery. 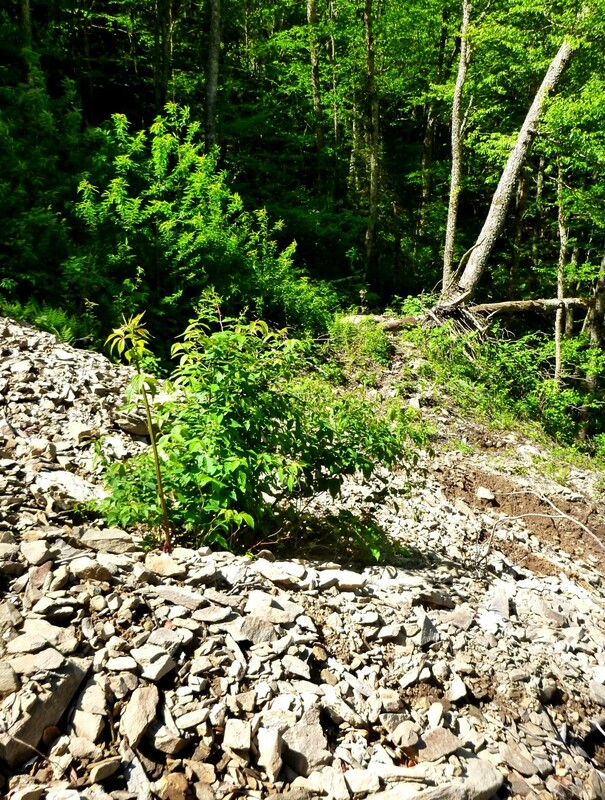 The flood created an enormous landslide in its upper section. 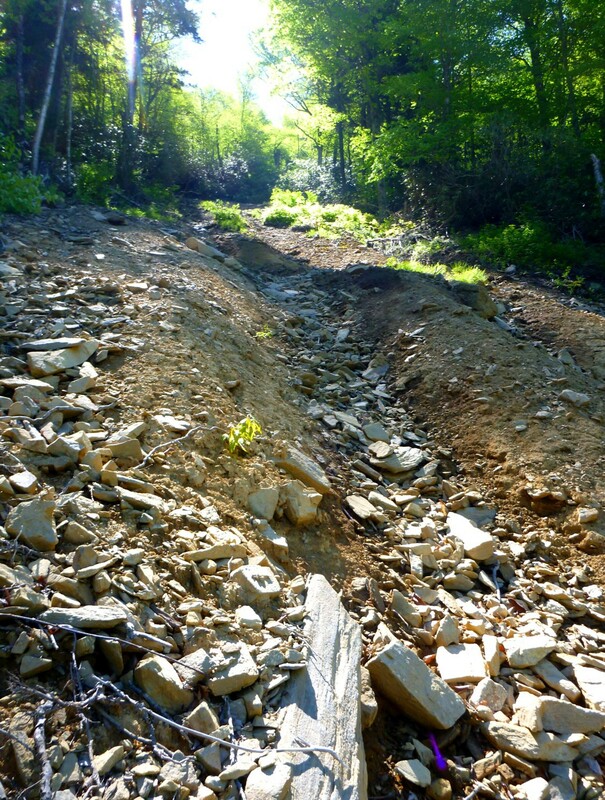 After looking at images of the slide on Balsam Corner Creek, a tributary of Straight Fork, I thought this might very well be the largest landslide that has occurred in recent memory in these mountains. Larger by far than any of the dramatic Anakeesta Ridge slides, larger than the Trout Branch slides, larger than the ones we know in the Lester Prong/Porters Creek drainage or the Bradley Fork drainage. Why do bushwhackers love landslides? 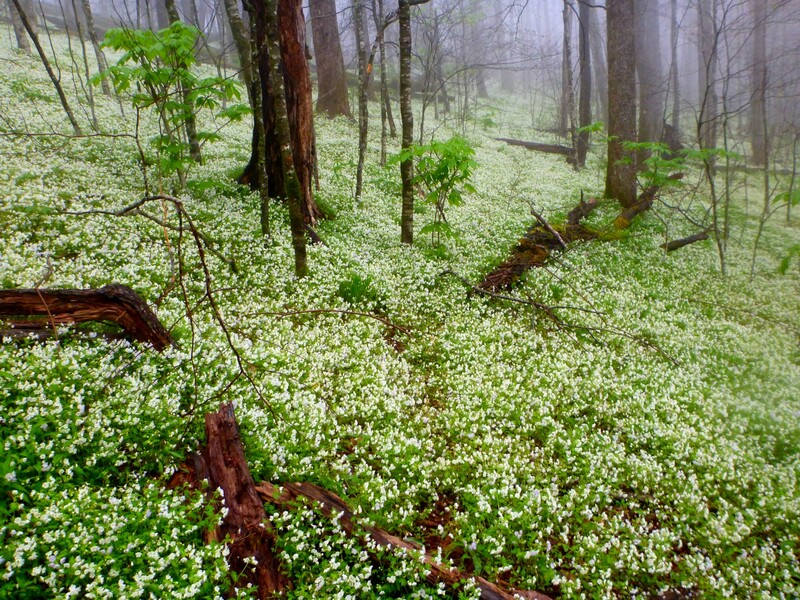 Because they often provide steep and spectacular routes through the dense vegetation of the Smokies. The map above gives a general idea of the lay of the land. From the Big Cove Road in the reservation, you go right at that important junction of Raven Fork and Straight Fork. That puts you on Straight Fork Road. You go past the fish hatchery and cross from the reservation to the national park, following beside the stream. Where the yellow line starts in the map above is where Straight Fork passes underneath the so-called “Million Dollar Bridge” that was constructed to replace a ford of the stream. 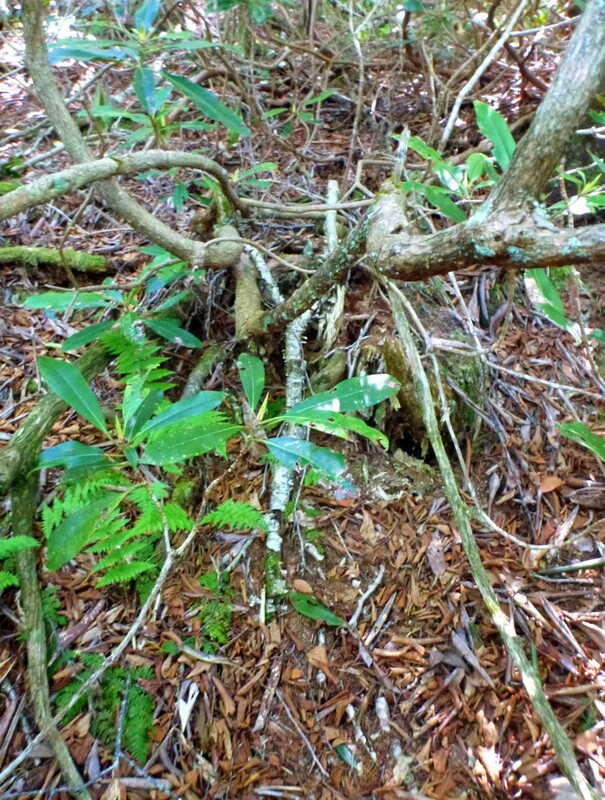 My friend Don Casada generously sent me several images of the Balsam Corner/ Straight Fork area. 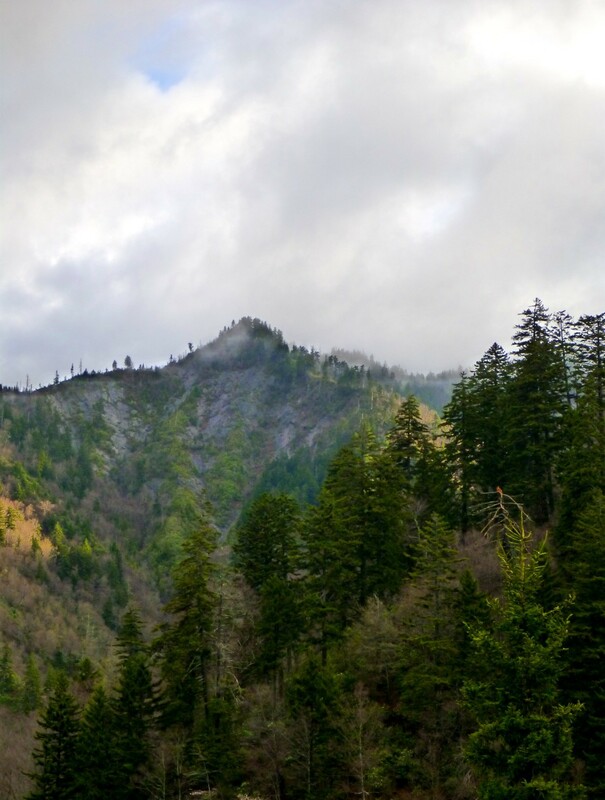 An oddity of the Balsam Corner Creek valley became clear: an old railroad grade from the pre-Park logging days reached its terminus very close to the head of the landslide area. 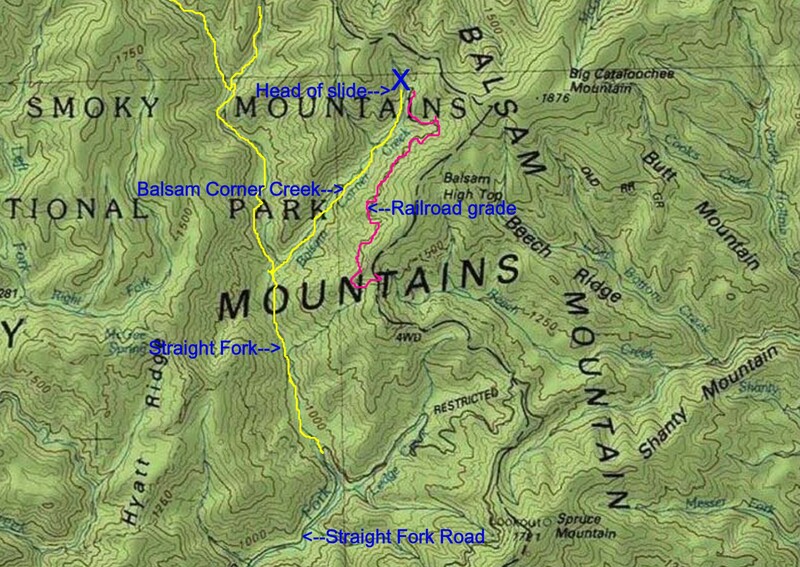 You see the railroad grade in pink in the map above, ending a short distance east of the “X” that marks the dramatic scoured-out area shown in the top image. In the past couple of weeks, as I have been preparing for my move to Northern Vermont, I have been fixated on getting in one last expedition—despite the bum knee, despite the fact that I’ve allowed myself to get somewhat out of shape. I hope this doesn’t sound too personal: I absolutely believe it is the right thing to do to move to New England, mainly because I can be of assistance to my sister. 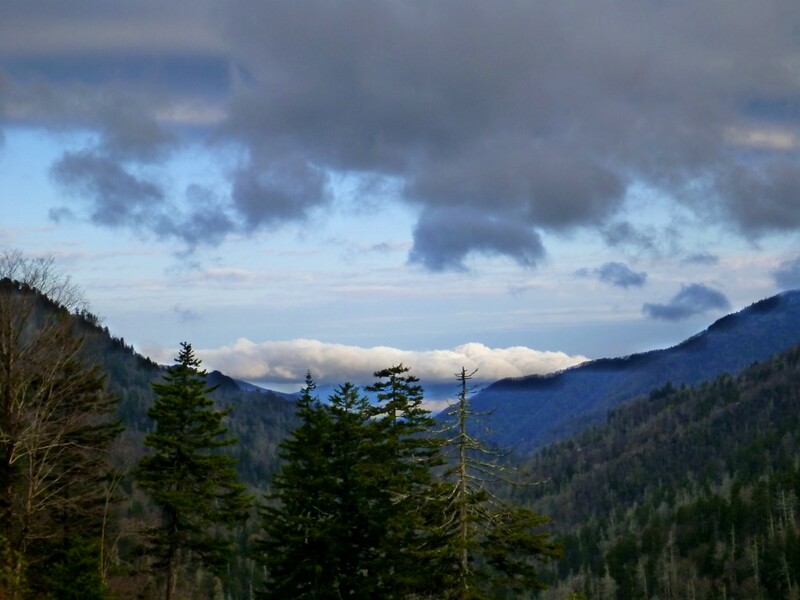 At the same time, I have struggled with my loss of the Smokies. I have been dealing with depression, and have not kept up my regular exercise routine as well as I could. Not that I’ve turned into a total couch potato, but I find myself weighing five pounds more than I should, and I seem to be hiking more slowly on the exercise hikes that I still manage to do. I decided I would do this trip by myself. Some of my very best adventures have been solo ones. There is a lovely, core element of self-reliance in these experiences. Also, much as companionship can be enjoyable, there is an equally valuable experience of being completely absorbed in the surroundings without any socializing going on. The self-reliance means: you make decisions on your own. That gives the decisions a kind of iron-edged quality—to use a somewhat peculiar metaphor. So: I figured I’d either go up the streams themselves, or I would use the Beech Gap trail to reach the start of the railroad grade, then follow that to the top of the slide. 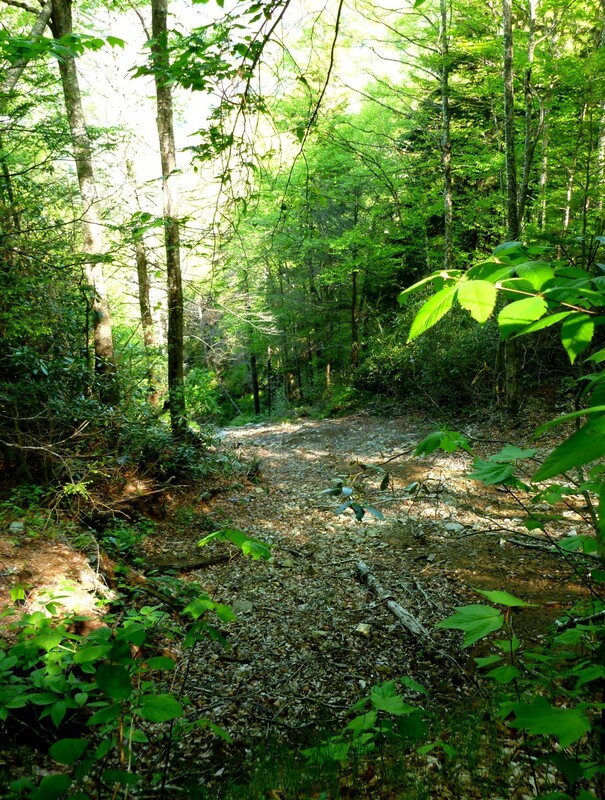 Either way, I’d climb from the head of the slide up to the Balsam Mountain trail and follow that and Beech Gap back down to my car. I liked the idea of following Straight Fork and then turning onto Balsam Corner Creek, seeing ever-increasing signs of the flood, like the giant logjams. But that would be pretty difficult. Over the past couple of weeks I watched the weather and waited for a long dry spell that would make that easier. So today was predicted to be the final day of the recent dry spell. I got up and drove to the Million Dollar Bridge. There I would make my decision, depending on what Straight Fork looked like. Well, I drove there, and it looked impossible even in low water conditions. Straight Fork is a large stream. Perhaps it would be easier in fisherman’s felt-soled boots. There is no way of rockhopping it at that point (certainly possible higher up). It would be a wade. I saw a fast-moving stream plunging over stairsteps of boulders. No way I could go up that for a mile and a half or two miles, then go another couple of miles up Balsam Corner! My opinion might conceivably have changed if at that point I’d been aware of a fisherman’s trail that went along the right side of the stream—something I observed when I came back down the Beech Gap trail at the end of my outing. (But I hear it doesn’t continue very long.) I also noticed, then, that Straight Fork in low water has considerably wide shoulders of dry rocks. But it didn’t look that way from the bridge early in the morning. I studied the black-looking pools (their darkness accentuated by a sky overcast at that point in the morning), and I made the decision pretty quickly to do the railroad grade route. So I headed up the Beech Gap trail. 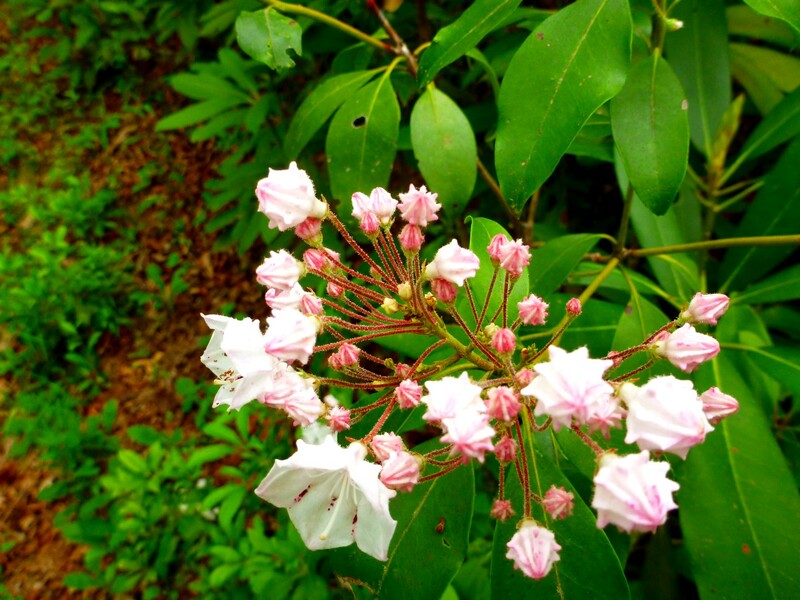 I was soon rewarded by abundant laurel in bloom. I like the buds as much as the blossoms. Everything is in multiples of five—I like to think of plants as having a mathematical identity. Laurel buds are unique in the way they develop in these sharp-pointed shapes. 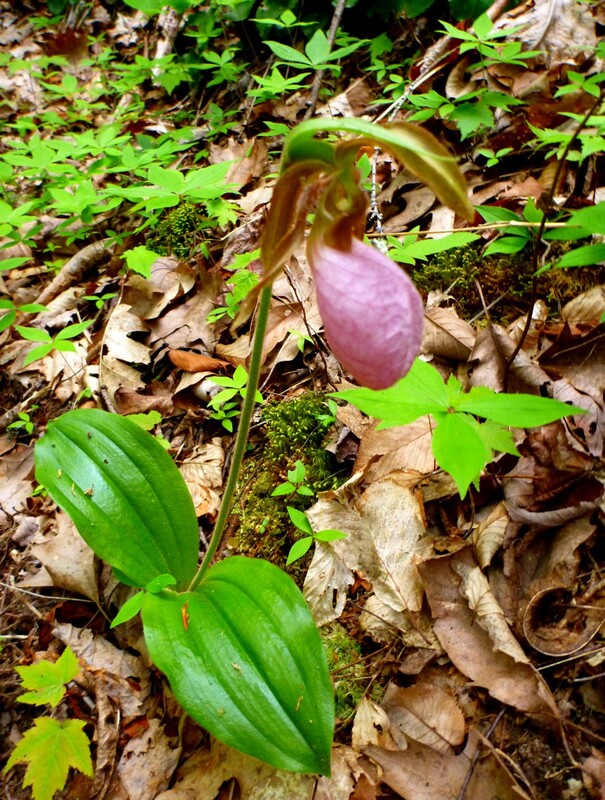 I even saw a pink ladyslipper. 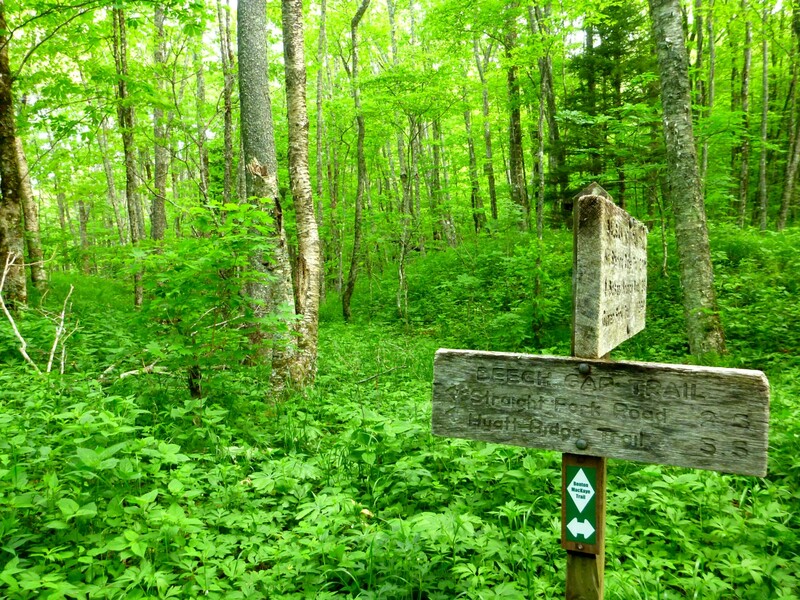 After 2.5 miles and 2000′ elevation gain, I reached the junction with the Balsam Mountain trail. There I easily made out where the railroad grade started. The interesting thing is that the grade continues from the same point over into the next valley, but that is harder to see. All along, of course, I had wondered what the conditions would be on the RR grade. Would it be blockaded by constant blowdowns? Would it be full of rhodo? This was actually kind of interesting because not only was I doing this by myself, but I don’t know anyone who has done it (though I am sure some folks have). At first it was lovely, open and grassy. Ah, if only it would stay like this! I passed below a large sandstone bluff. There must have been a trestle below it to get the logging trains across a steep, bouldery slope. Bluff above, boulderfield below—there must have been a trestle. I started to notice game paths along the wide grade. The interesting thing was that these were not bear paths. I have followed bear paths many times. These paths were made by larger, heavier creatures who broke off branches higher than the height of a bear. I am certain this grade is used by elk. 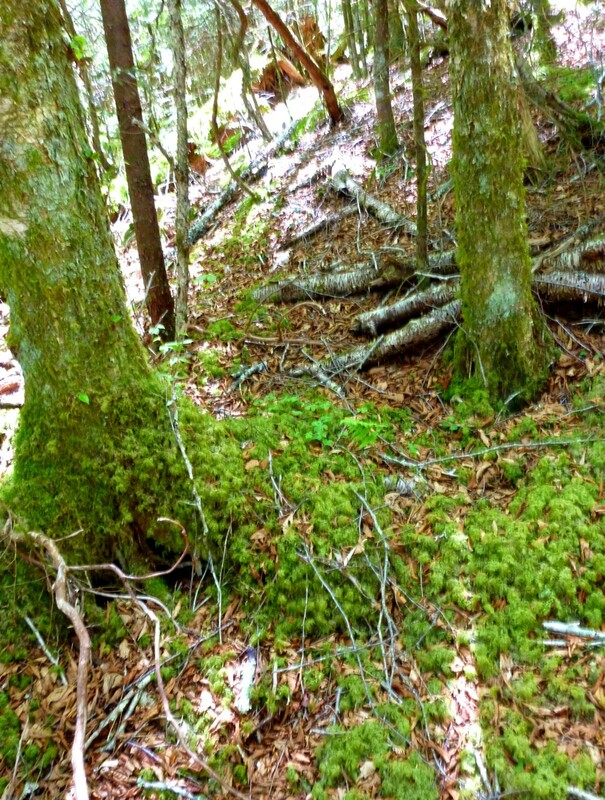 I have seen elk prints on the other part of the Beech Gap trail (that goes to Hyatt Ridge), and I know there is a migration between the Cataloochee area and the Oconoluftee area. The elk were very helpful for me, because when I started running into rhododendron patches, they made a path on the outside edge of the grade, sometimes going slightly downslope (which was always steep) and then returning to the grade. I could tell, on these downslope detours, that I was not dealing with bear tracks. The elk, with their relatively heavy weight, stepped down and made strong imprints in the slope which were then followed and reinforced by other elk. Bears do not make those kinds of imprints. With their soft paws, they go up and down slopes, and leave a mark of their passage, but they don’t make this indented stairstep pattern. Well, could I have been following footsteps of other humans? While, as I said, I imagine a few other folks have been here (I did see a pruning cut in one place), there was something about the breakage of branches and the heavy hoof marks that convinced me this is an elk passageway. After a while I came to the first of several tributary landslides that I saw. This one started immediately below the RR grade. The photo makes it look nearly flat, but in reality it was quite steep. Now, this was really interesting to me. This meant that the whole Balsam Corner Creek valley was subjected to incredibly heavy rainfall, creating these tributary landslides that ran into the main stream valley below. And yet, within that general event—pretty severe as it was—there was a micro-event that was even more devastating. At this point along the RR grade I was running into rhodo patches at regular intervals, but it always seemed as though there was a way not too horrible to pass through or around, thanks partly to my friends the elk. I also saw remains of the logging activity. 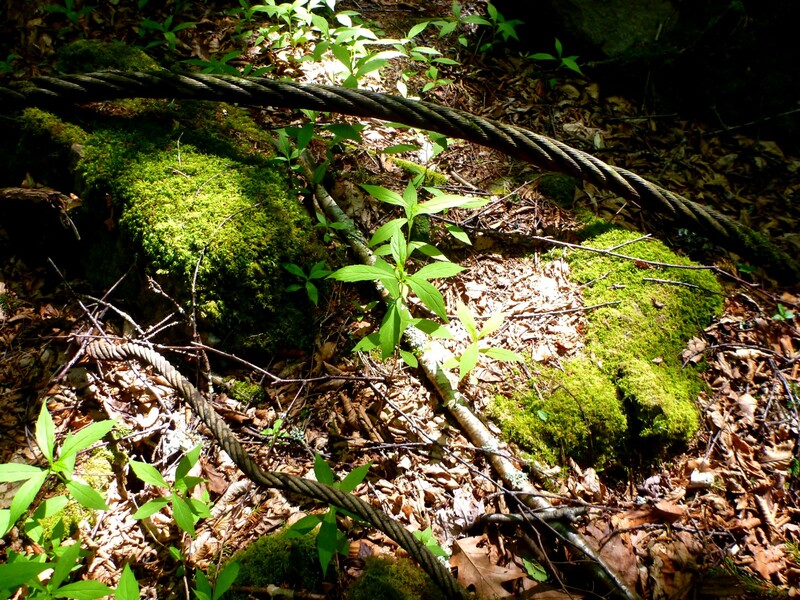 In many places I saw cables coiling across the RR grade. I came to another tributary slide. This one was much larger, and it started way above the grade, came down and obliterated it, and continued down to the stream valley. In this photo, I am looking directly across to where the grade was erased by the slide. I was able to pick it up on the other side. This is looking up the slide from where it covered the grade. Something important here that I want to share with folks who might want to explore this valley. Note the absence of visible bedrock in this slide. It is a mix of loose dirt and rubble. People who are looking for something like the Trout Branch slide or some of the Anakeesta slides may be in for an unpleasant surprise. This stuff could easily be the “two steps forward, one step back” kind of situation. I don’t know. I didn’t climb up it. I was still trying to follow the grade. Well, finally I met my nemesis—a giant rhodo hell. When I got to the front of it, I faithfully followed the elk hoofprints down the slope to get around this mess. This time they went down a lot further than before. I crossed a small draw and knew I had to climb up again to return to the grade. I climbed up—did not see a grade—kept going, going, looking. I never found it. 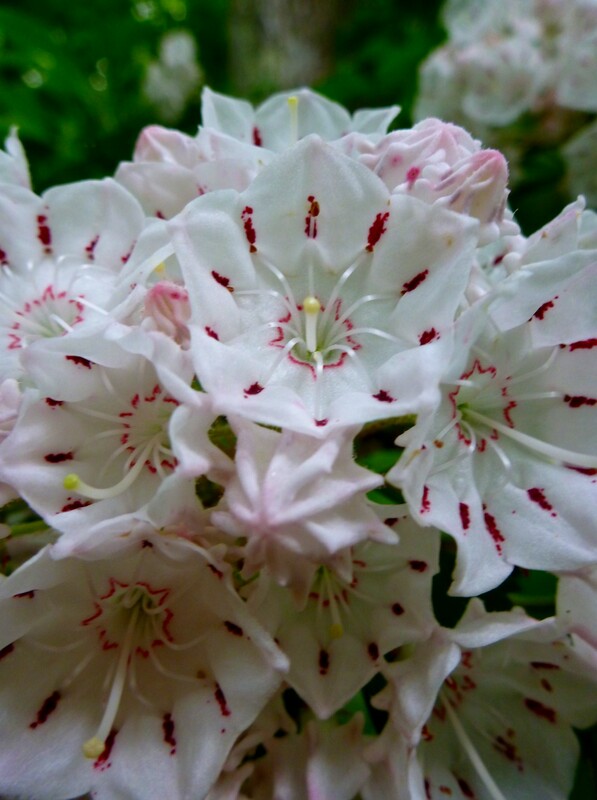 This was a miserable tangle of rhodo. Was it possible that I had reached the end of the grade? I’m pretty sure not. I believe based on my compass direction, and also based on where I eventually climbed out, that I was a little bit short of Laurel Gap Branch. 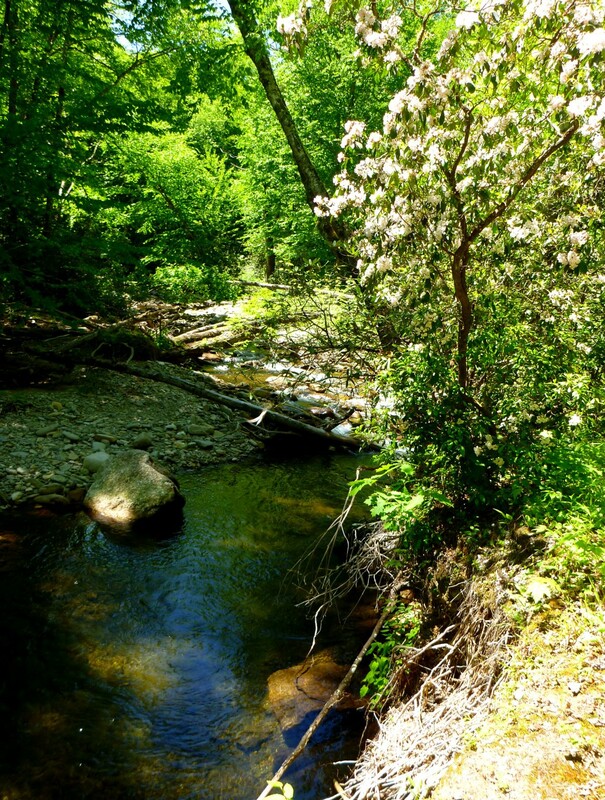 So—why not drop down to the stream itself, to Balsam Corner Creek, and then follow that up? Because everything below me was a rhodo jungle, and I was now at a point pretty far east of the main stream. That meant it could have taken an hour of crawling to get down to the stream. If I had been able to stay with the grade, it would have trended back west and gotten close to that upper scar. But I could not find the grade. Finally I decided to go up and hit the Balsam Mountain trail. Then, I thought, I might walk up the trail to the closest point above the giant “X”, drop down to it, and then just climb back up. I started making my way up toward the trail. It took me half an hour to go 200 vertical feet. If I’d known how bad it was going to be, I would have done whatever it took to return to the big slide pictured above and go up that. But you know how these things go—after a while you’re committed. With a great amount of relief I finally entered a relatively open spruce forest, though with snarly arms of rhodo still reaching through in many places. 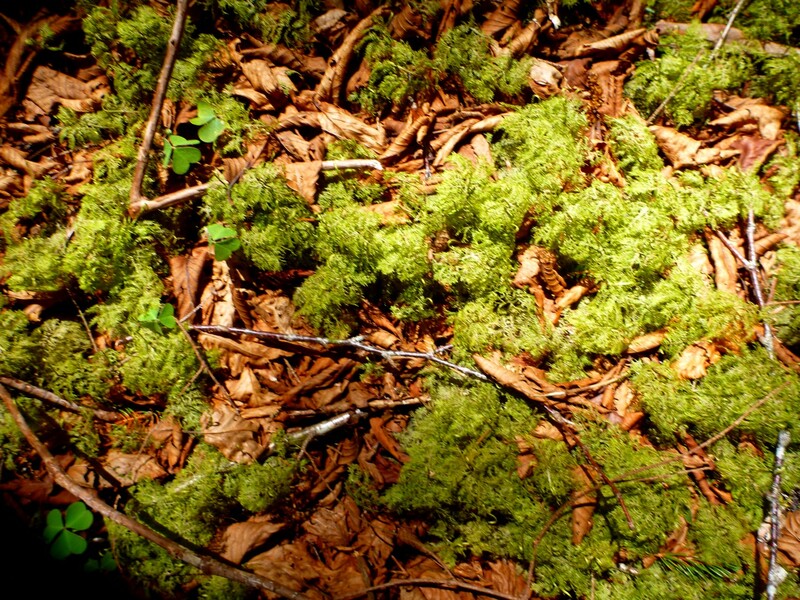 I always love the moss in these kinds of places. 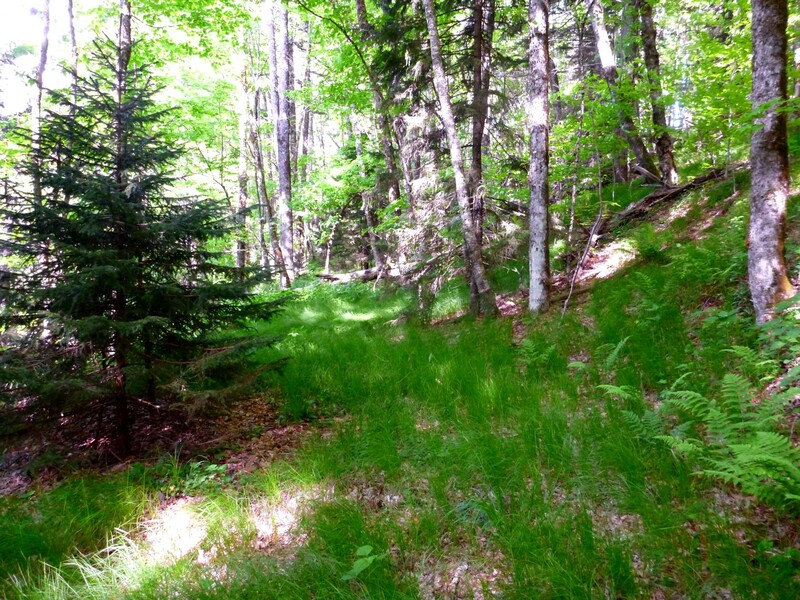 It turned out I was crossing the northeastern slope of Balsam High Top. Fortunately, from studying my compass and the map, I realized that’s what was happening. I had gone in a more southerly direction that I’d planned, but that was because I was following the path of least resistance through the rhodo. So I wasn’t unduly alarmed when I reached the crest of the ridge and found no trail. As it turned out, I hit the ridge at just about its furthest point from the trail. I must admit that as I crossed over the ridge and started descending, I was really hoping I would find the trail soon. And before long I did. I sat down beside the trail and had some food and water. Soon a young couple came along, asking if they were headed toward the Balsam Mountain Road (they were). 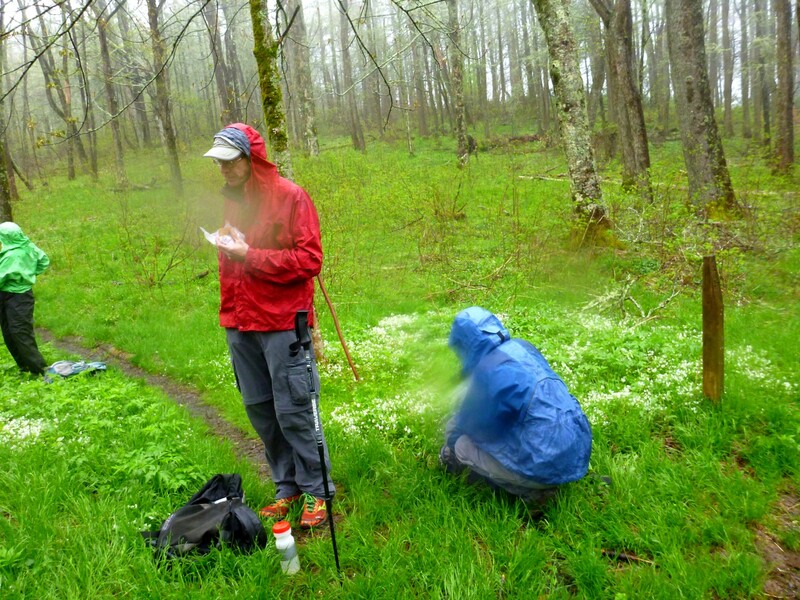 I think proper bushwhacker etiquette demands that you never tell trail hikers what you have just done (a form of boasting, I think). But in reality it doesn’t matter because they never understand anyway. I happened to have my map out, and I pointed to the RR grade and said I’d gotten into a rhodo thicket and had just come out on the trail. They nodded politely and went on. Now—was I really going to continue north on the Balsam Mountain trail to the closest point to the giant “X”? All of a sudden I started wondering if the whole slope above the “X” was another rhodo hell. I’d have to go down it, and then back up. It didn’t take me long to decide to wimp out and go back to my car. 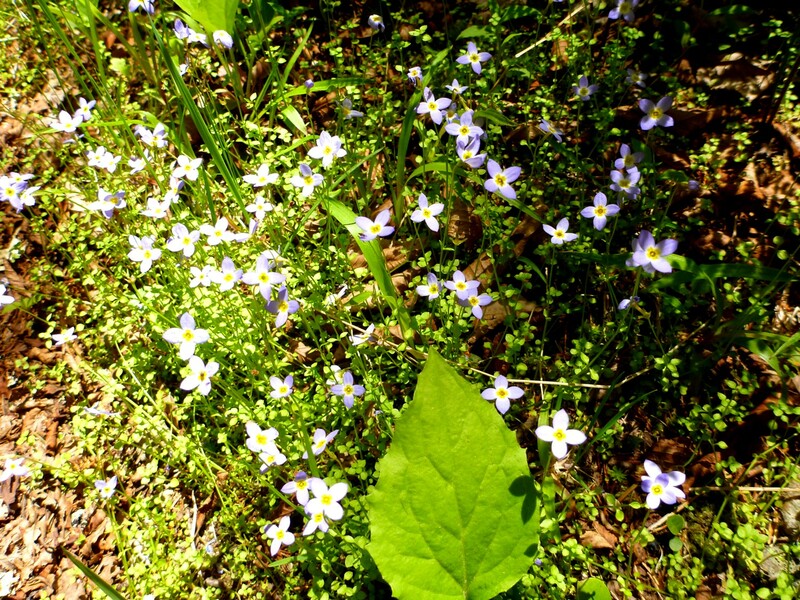 I saw some nice bluets along the trail. 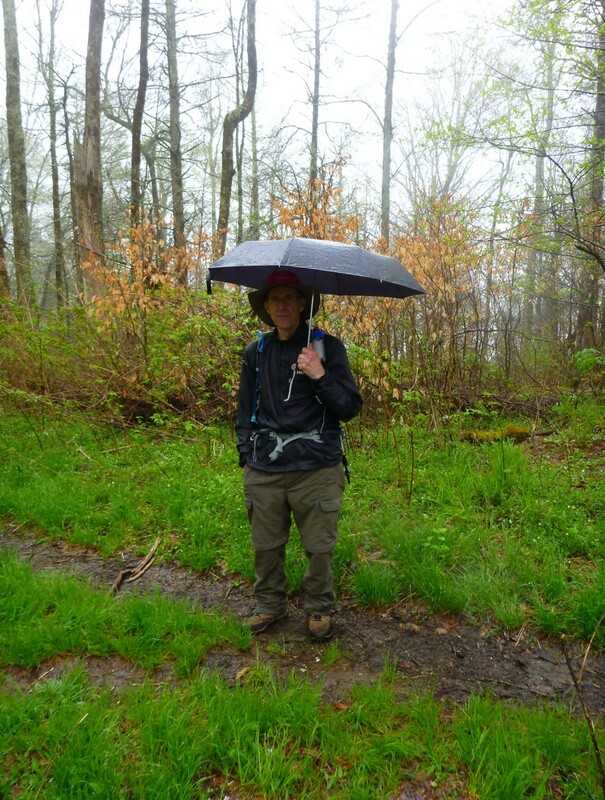 After a while I got back to the Balsam Mountain/ Beech Gap junction, turned down there, and eventually returned to the trailhead. This time I noticed there was a trail that led next to Straight Fork. Beautiful laurel next to beautiful stream. This section of Straight Fork, not very far above the bridge, did look easier to deal with. But still, I think it would take a strong, athletic person to go up the stream to Balsam Corner Creek and then all the way up that. I must say that I do not think I am strong enough to do that right now, though I hope to regain my psychological equilibrium and be able to do things like that again. 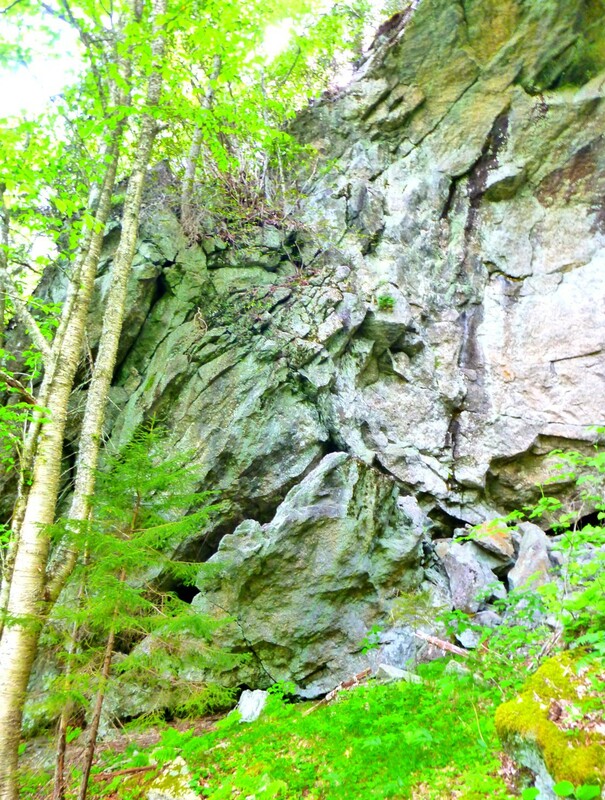 After all, I have to climb the Ravine of Raymond Cataract and the abandoned Adams Slide trail in the northern Presidential Range of New Hampshire. 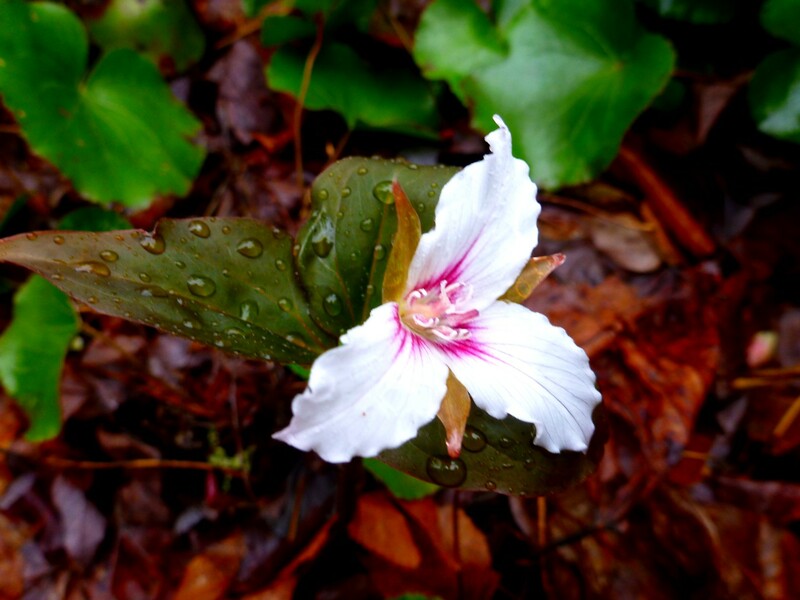 Posted by Jenny in bushwhacking, hiking, nature, Smoky Mountains. Snowy fields of fringed phacelia along the manway. The forecast kept changing. Showers all day—rain in the morning followed by clearing—low probability of precipitation, or high—at any rate, I suspect the uncertainty kept some folks from joining our outing. We had nine in our group, and it was a wonderful hike. 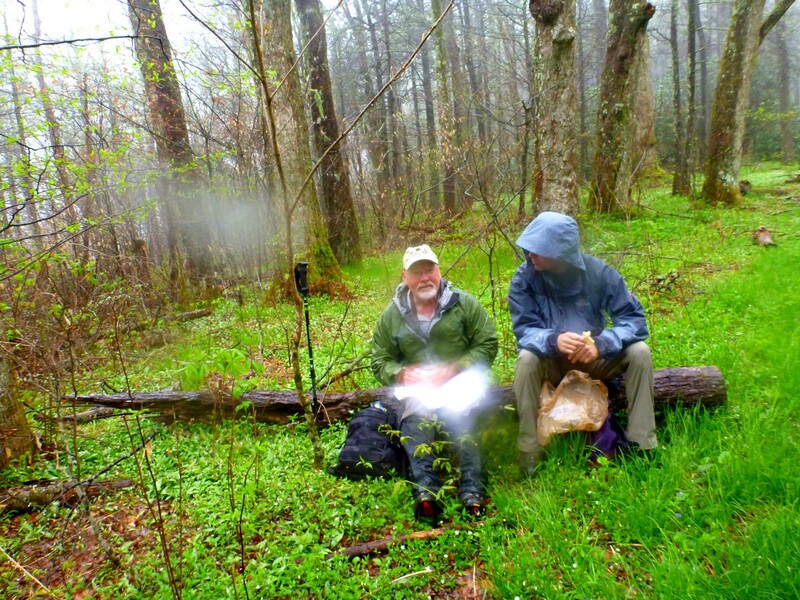 We shared an enthusiasm for the remarkable plant life that thrived all along our route, and for the bird songs, the trees, and the history of this part of the Smokies. As it turned out, we had intermittent showers throughout the day, but the temperature remained comfortable. 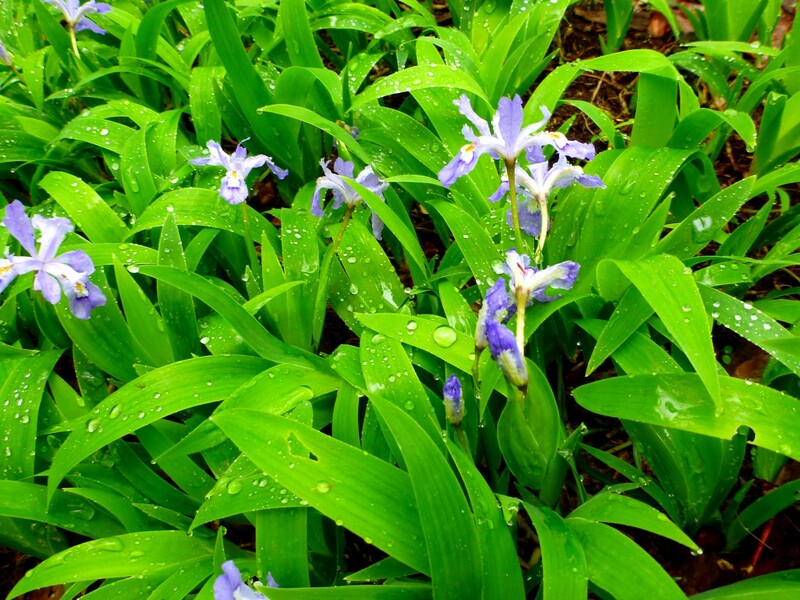 And what is better on an April day than to observe swarms of wildflowers gleaming with shimmering raindrops? As I drove over to Elkmont from the North Carolina side of the mountains, I enjoyed dramatic changes in the skies. Sometimes I drove through dense fog, and other times I observed a spotlight effect of sunlight coming through the clouds. On my drive over—dramatic sky near Newfound Gap. Beams of sunlight near Anakeesta Ridge. As soon as we started on our way up the Jakes Creek trail, we were luxuriating in the lush cushions of wildflowers all around us. When we reached the Miry Ridge trail and climbed up to the distinctive open heath area, we debated whether to make that our lunch spot. It is an interesting place, full of laurel and galax and reindeer moss, but the fog had closed in and we had no views. We opted to continue to the backcountry campsite. Just as we stopped for lunch, it started to rain fairly heavily. I took a few photos that were blurred by the dampness. Jim and Ken talk things over in the rain. Hiram and Jean in their rain gear. Michael Ray had a more sensible way of dealing with the rain. We continued along, and I started looking for the manway where the trail reaches the crest of the ridge. But Michael, who has been on the manway six times, spotted the junction before I did. I had a momentary thought: “They’re going to think I don’t know how to follow the manway.” In reality, it all worked out perfectly. There are places where you can either stay on the ridgecrest or contour along the side. At times some of us went one way and some another, but our routes were always within sight or at most calling distance of each other. The general direction remained clear. I found that the pathway was easier to follow at this time of year than when Ken and I scouted it. At that time, the forest floor was uniformly brown, covered with fallen leaves. But yesterday, the path was often clearly marked by the relative absence of vegetation on the path. Well, at least that was true in the grassy areas, where the grass does not grow in the path. When we came to the fringed phacelia, it grew exuberantly all across the footway. Once you reach the sharp turn to the left where you see some CCC rockwork, the old trail becomes very clear and nearly impossible to lose. It’s just that you encounter considerable rhodo and doghobble in this section. Eventually we reached a notable spot where a quartz rock is embedded in a tree. Members of the group had different theories about this. 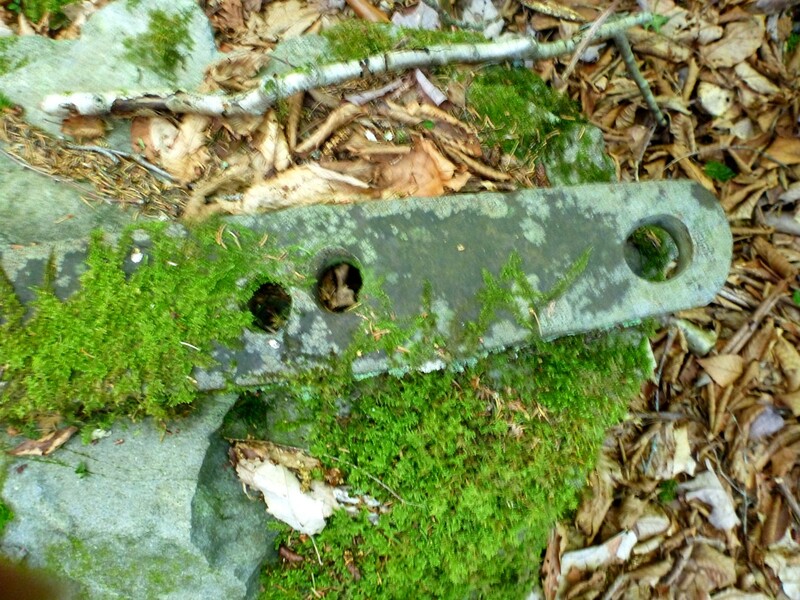 Some thought it was a boundary marker, while others thought it was the doing of the CCC folks. It was a truly enjoyable outing with a great group of hikers who are all seriously interested in the marvelous natural offerings of the Smokies. I will soon have to leave this area, but I will be back for visits as often as I can. We saw this somewhere along our journey—I won’t say when or where. NEW HISTORY BLOG: 1870 TO 1918 Go to 1870to1918.wordpress.com to read the latest installment, titled WORDS OF ENDURANCE: MEMOIRS OF AN INFANTRY OFFICER. Peter Barr on the A.T.
All contents of this page and of the blog as a whole are copyright to Jenny Bennett and may not be quoted or used in any form without the permission of the author.